Welcome to Window Techs, Manufacturer and Trader of Furnishing Fabrics. We are an ISO 9000:2000 and 9002 certified company, incepted in New Delhi. We have spread our wings to UK, Africa and Europe and we cater to Hotels, Embassies and other sectors. Assured quality products, Premium grade raw materials and Delivery within time frame are the plus points of our organization. We offer a wide assortment of Soft Furnishing Fabrics, Curtains and Blinds. We also provide Grail curtain track, Panel Track System and Remote Controlled Curtain Tracks. 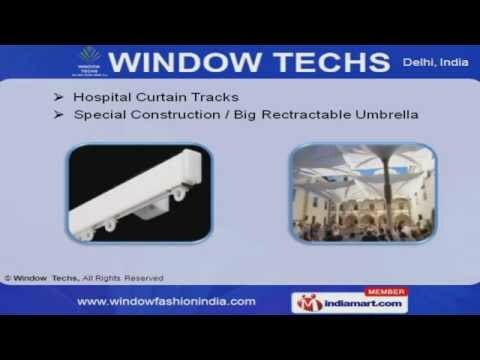 We are able to offer an exclusive range of Hospital Curtain Tracks, Special Construction and Big Retractable Umbrella. Our Big Dividing Curtain Fabrics, Fire and Smoke Curtains are best in the industry amongst others. We are one of the trusted names of the industry engaged in offering genuine quality Lighting and Dimming Control Systems. Unveil a comprehensive range of Skylight, Sandwich Glass Blind and LUTRON Lighting Automation system.